£30 Amazon Voucher for the best ‘My EPS Journey’ Reflective Journal! Reflect on the skills and experiences you have gained through the EP Scheme by creating a personal ‘My EPS Journey’ Reflective Journal on MyFolio. Your ‘My EPS Journey’ profile page outlines the activities you have completed to earn points and the rewards you’ve undertaken. You can publish your journal online, adding the link to your CV and LinkedIn profile. It’s a fantastic way to demonstrate your skills to prospective employers in a fun and creative way. You can find our How-to Guide, as well as examples of past entries here. 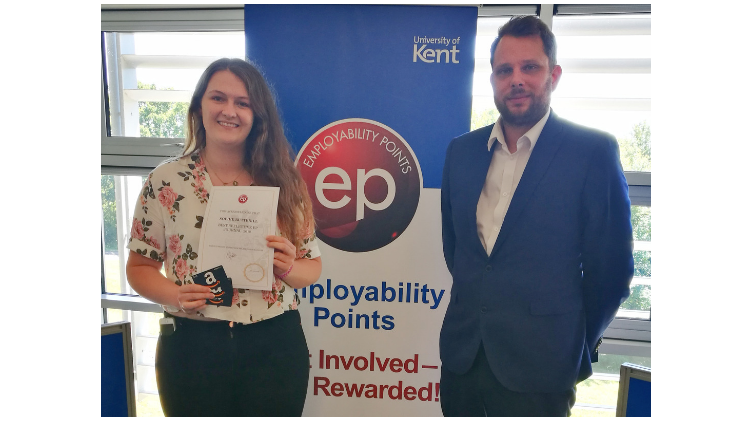 Once you’ve finished creating your profile, email the link to the EP team via employabilitypoints@kent.ac.uk to be in with a chance of winning! The prize for the best Journal is a £30 Amazon Voucher and you can claim 5 points for having a go! The deadline to submit a journal is 5pm on 14th June 2019.